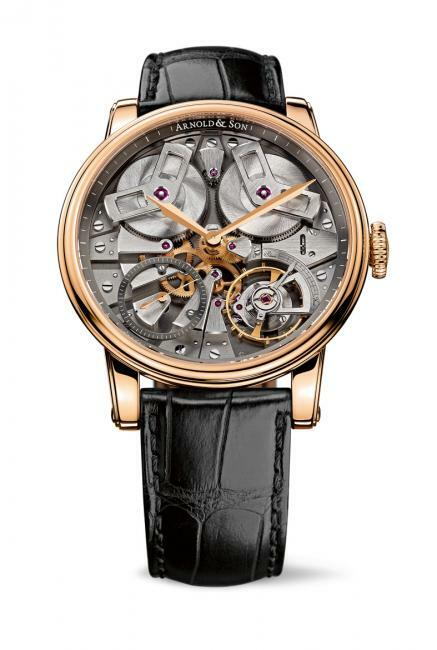 With timepieces that reference its English watchmaking heritage, Arnold & Son unveils two new versions of its famous TB88 featuring the hand-finished A&S5003 calibre. Conceived, designed and manufactured in-house, these superbly engineered wristwatches are part of the Royal Collection that combines classical styling with leading-edge technology. John Arnold was an exceptional watchmaker, who excelled in the development and production of marine chronometers. With his son, he built up a company that established itself as one of the most reputable suppliers of timepieces to the Royal Navy as well as intrepid explorers like James Cook, Matthew Flinders and George Vancouver, to name but a few. By the early 19th century, he had several major patents to his name and created a minor storm in precision timekeeping with the Arnold No. 36, the first-ever watch to be called a ‘chronometer’ – a term used to this day for a supremely accurate timepiece. The Arnold No. 36 was considered so important that it was included in the collection of the National Maritime Museum in London, where it can still be seen today. The TB88 is proof that the company has lost none of its appetite for innovative technology or precision timekeeping. The A&S5003 calibre brings together all the technical and aesthetic characteristics of a classical John Arnold chronometer. The letters ‘TB’ stand for ‘true beat’ (or ‘dead beat’), a complication that alludes to the precision timekeeping required for navigation at sea. Unlike conventional mechanical watches, a true beat movement measures out time in complete seconds rather than fractions dependent on the balance frequency. This is useful for determining the exact time and, consequently, longitude, and makes it invaluable at sea. The TB88 is also a tribute to John Arnold’s earliest known pocket watch, of which the original case bears the number ‘88’. The number is replicated by the design of the movement, with its perfectly symmetrical layout featuring the twin barrels at the top, the balance wheel between 4 and 5 o’clock and the true beat seconds indicator between 7 and 8. 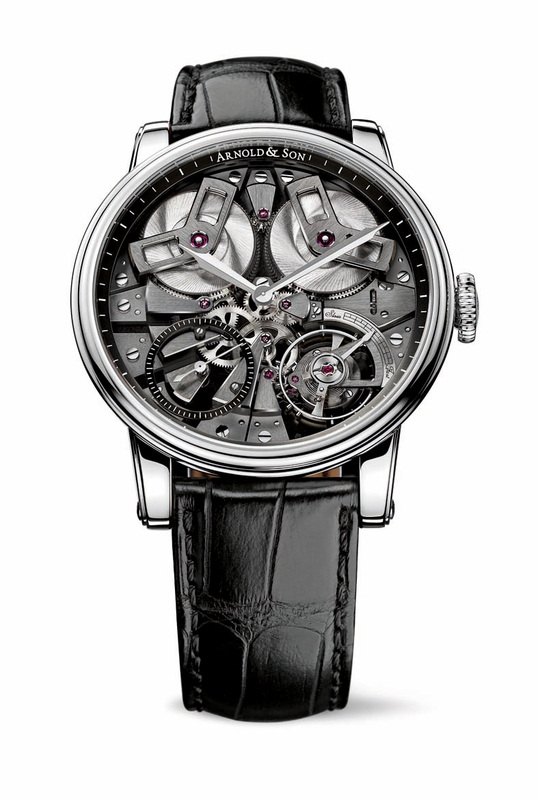 Exclusive Arnold & Son A&S5003 hand-wound mechanical movement, with each of its 16 pivoting elements mounted on its own bridge. But the feature that unquestionably sets Arnold & Son’s new TB88 apart is its unique ‘English’ movement design, as expressed through features like the straight-cut bridges. Each of the pivoting elements in the movement is mounted on its own bridge, 16 in total! 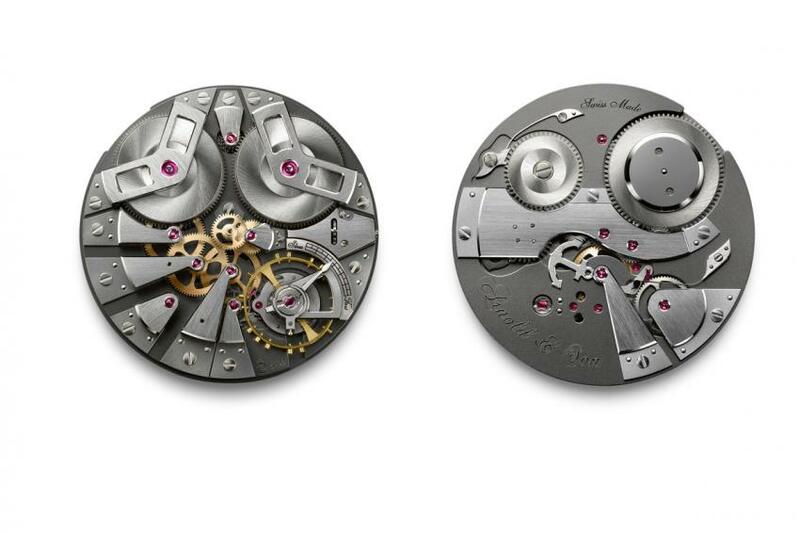 Compared to usual movements, the TB88’s movement is partly ‘inverted’, which means that the technically and aesthetically interesting features are on the dial side of the movement instead of being hidden away on the reverse. The front showcases the two barrels, which generate a minimum of 100 hours power reserve when fully wound, the gear train and the balance wheel with its Breguet overcoil spring. Bending and fitting such a spring by hand is a delicate and highly skilled operation mastered by a precious few watchmakers. The complex true beat seconds system as well as the winding and setting mechanisms are located on the reverse of the movement. Further shining examples of watchmaking at its finest is the A&S5003 movement’s entire haute horlogerie finishing, with the hand-chamfered and polished edges of the bridges and of all the steel parts. The three-dimensional effect of the movement is further enhanced by the fascinating juxtaposition of grey and brushed bridges on a black main plate (new TB88 stainless steel case) or palladium and brushed bridges on a NAC grey main plate (new TB88 18-carat rose gold case). These new galvanic platings further highlight the mechanical complexity of these magnificent timepieces. The case of the TB88 is characterized by its unique English style: discreet opulence offset by the elegance of a double-step bezel and lugs, gently flowing contours and soft curves. The TB88 is housed in either a 18-carat rose gold case or stainless steel case measuring 46 millimeters in diameter, which is water-resistant to 30 meters and secured to the wearer’s wrist by a hand-stitched black alligator leather strap.